New Horizons flew by Pluto’s big moon, Charon in July and finally sent back images on September 21st, 2015. What these pictures revealed surprised the research team and space-lovers everywhere. 1 Mountains, Canyons, Landslides and More! Mountains, Canyons, Landslides and More! Nobody really knew what to expect from a natural satellite on the edge of our Solar System. Researchers theorized that Charon would most likely just be a colorless rock with multiply pock-marks created from crashing space debris; however, what their technology uncovered was fascinating to say the least. What has Beyer and his team so enthused? The images revealed Charon has a number of mountains, canyons and landslides dotting its surface and also a belt of fractures just north of the moon’s equator. The canyon is massive, stretching approximately 1,000 miles (1,600 kilometers) across the entire face of this moon and most probably around to its far side. These faults and canyons could very well be signs of a geological upheaval in Charon’s past that is actually four times as long as our Grand Canyon and in spots, twice as deep! Researchers are astounded at these findings and are comparing Charon’s surface canyon to that of the Mars Valles Marineris canyon. Another interesting discovery is the plains south of the Charon’s Vulcan Planum canyon have fewer large-size craters than that of the north region. This could be an indication that these canyons are younger. The team also noticed the plains were quite smooth, stating this is a “clear sign” of wide-scale resurfacing. In addition to Charon’s varied structure, perhaps the most astounding is the surface-color variations on this moon’s northern pole. Science has discovered Pluto is a brownish-red due to its frozen surface-methane (which breaks down in the Sun’s light creating an ultraviolet reflection that appears red) but Charon is actually more like our moon (greyish-tan) and appears to be covered in water-ice. 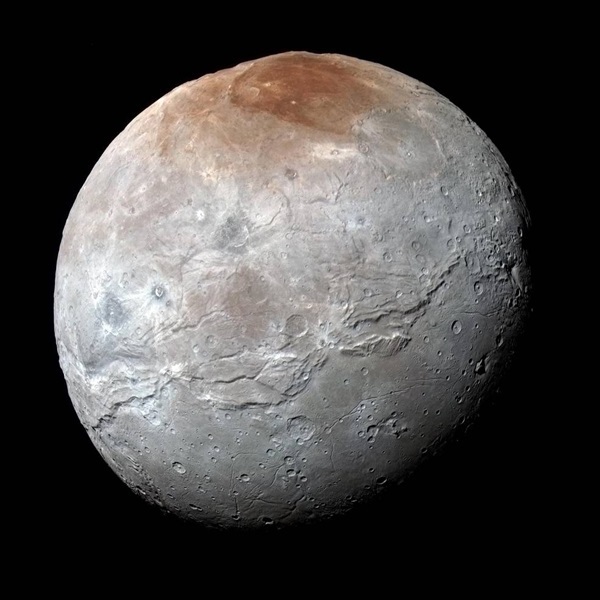 So what is causing Charon’s polar region to be tinted red? The surface of Charon is frigid, in fact over the course of a year its polar temperatures are between -433 and -351 degrees Fahrenheit (-258 and -213 degrees Celsius). This is only ten degrees warmer than absolute zero! For this reason scientists know Charon is too cold for anything other than solid materials to exist on its surface, which leads the team to conclude that this moon’s northern pole must be made of up different material from the rest of it – this is where cold-trapping comes into play. The theory suggests that bits of Pluto’s atmosphere can escape and eventually reach Charon, but since this moon is too frigid the atmospheric debris (or gases) would instantly turn into a solid. Pluto’ atmosphere is made up of mainly nitrogen, with some methane and carbon monoxide which could now be coating Charon’s northern region. However, when the Sun hits this moon’s winter pole the radiation from it will modify the ices, producing a new substance. The new substance which appears to be present on Charon is called, Tholin and has been replicated in laboratories here on Earth. Tholin can vary in color from yellow to red to black depending on the ratios of the different molecules and also the type of radiation they have been exposed to. The best theory of Charon’s discoloration is the deposits at the polar region have been building up for millions of years. With the radiation of the Sun, the conditions are perfect to form red tholins on the surface. Although science still has some investigating to do, with the help of New Horizons they are getting ready to embark on a whole new adventure. What Charon has to reveal is yet to be discovered, but you can bet whatever it is, it is sure to be remarkable.